2015. Interactions between the invasive European green crab, Carcinus maenas (L.), and juveniles of the soft-shell clam, Mya arenaria L., in eastern Maine, USA. Journal of Experimental Marine Biology and Ecology 462: 62-73. Typical damage to a juvenile soft-shell clam by a green crab. Invasive species pose a threat to biodiversity in numerous marine ecosystems, and may have severe economic effects on commercially important species. The European green crab, Carcinus maenas, is one of the most common invaders of marine ecosystems globally. 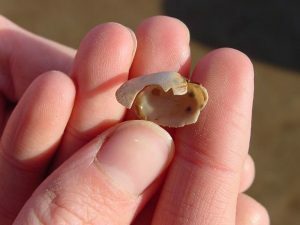 Since its invasion into eastern Maine, USA, during the early 1950’s, populations of the soft-shell clam, Mya arenaria, have declined greatly. This has triggered the establishment of shellfish hatcheries and the development of aquaculture techniques to enhance the wild fishery. This study investigated interactions between C. maenas and cultured juveniles of M. arenaria both in the field and laboratory. In the field (Holmes Bay, Cutler, Maine), clam (initial mean shell length [SL] ±95% CI: 15.8 ± 0.5 mm; n=30) survival was: 1) 7× higher in predator deterrent treatments compared to open controls; 2) not improved by using rigid vs. flexible netting; and, 3) not improved by raising and supporting deterrent netting 5 cm above the sediment surface. Wild clam recruitment was 4x greater in protected vs. open experimental units. In laboratory trials using similar sized juvenile clams, green crabs consumed clams protected by predator deterrent netting, and in one case did so without leaving visible signs of chipping, crushing, or disarticulating the valves. Physical evidence, other than crushing, may be used to differentiate between clam death due to predation vs. suffocation, disease, or other sources of mortality. Beal, B.F.; Nault, D-M.; Annis, H.; Thayer, P.; Leighton, H.; Ellis, B. 2016. Comparitive, Large-Scale Field Trials Along the Maine Coast to Assess Managment Options to Enhance Populations of the Commercially Important Soft-Shell Clam, Mya arenaria L. Journal of Shellfish Research, Vol. 35 (4), 711-727. During the past 40 y, commercial production of softshell clams, Mya arenaria, in the soft-bottom intertidal zone in Maine, United States, has decreased nearly 75% whereas dockside revenues have increased ca. 200%. The fishery is comanaged by coastal communities (some individually, some working together as a regional unit) and the state of Maine acting through its Department of Marine Resources. A number of shellfish management tools are available to clammers and stewardship committees to help increase or improve harvests. One of these, used by some communities, is the ‘‘conservation closure.’’ This is when large acres of mudflats (sometimes > 200) are closed to harvesting and fallowed for periods as long as a year because either the area is no longer productive, too few legal size clams (>50.8-mm shell length) exist, or the community wishes to practice some direct measure to improve harvests such as transplanting clams from one area of the intertidal to another. A series of comparative, large-scale manipulative experiments were conducted at each of two intertidal mudflats in three geographically distinct coastal communities along the Maine coast during 2014–2015 to examine potential management tools for areas closed for conservation purposes. Specifically, tests were conducted to determine the efficacy of using plastic predator-deterrent netting (18.21 m2; 4.2- or 6.4-mm aperture) to enhance: (1) recruitment of 0-y class wild juveniles, (2) survival of greater than or equal to 1-y class wild juveniles, and (3) wild stocks using cultured juveniles. Findings demonstrated that indiscriminate placement of nets did not result in consistent enhancement of wild recruits (occurring once in 12 trials). Survival of greater than or equal to 1-y class individuals was not enhanced in netted versus control plots at any of the six sites in 2014, but occurred in four of six sites in 2015. Cultured clam survival (May to October 2015) at the four sites where nets functioned properly varied from 65% to 100% and was independent of aperture size; however, where siltation was heavy or mud snails [Tritia (= Ilyanassa) obsoleta] deposited massive numbers of egg capsules on the nets (both scenarios resulting in anoxic conditions in the protected plots), survival ranged from 0% to 48%. Average annual and wintertime seawater temperatures in the Gulf of Maine have risen gradually during the past two decades, and this has been accompanied by increases in clam predators such as the invasive European green crab, Carcinus maenas. In this climate, conservation closures or other large-scale, indirect shellfish management tools cannot be effective in creating new wealth or maintaining jobs associated with the clam fishery in most areas. Therefore, to adapt to changes and increase diversification in the clamming industry in Maine, clammers should be encouraged to farm small (ca. # 10 acres) intertidal tracts where netting and other predator-deterrent measures can be maintained easily and routinely, and where exclusive rights to harvest the farmed shellfish are granted to the individual.